Four Corners Alliance Group is the revolution in online wealth creation. It is to help network marketers, affiliate marketers and entrepreneurs have massive financial breakthroughs and create a permanent change in their quality of life and financial situation. Four Corners Alliance Group is a network marketing company based in Las Vegas, Nevada. The company was founded by a guy named David Harrison in 2013. The company has a basic network marketing structure: you buy into the company in exchange for an $18 buy-in fee. Then, you convince other people to buy into the company as well. Once you’re in, you try to sell people other products in exchange for more commissions. There are two core Four Corners Alliance Group products, including a financial education set and a monthly newsletter. Affiliates can sell these products themselves or point customers towards the Four Corners online store, where prices are marked up by 33% and all additional commissions go directly to the affiliate. Ultimately, the books are not much different from what you would find on an average financial advice website online. However, if you’ve always wanted to learn more about forex trading, options trading, bond trading, and other financial tools, and you want this information in a convenient downloadable eBook, then you might find this information to be valuable. Otherwise, the primary reason you buy these books is to convince other people to buy them as well. All books come in the form of a downloadable eBook. The other main product at Four Corners Alliance Group is the monthly newsletter. You earn 80% commissions from selling the newsletter. When you buy the newsletter (which costs $29.95 per month), you get access to the financial books listed above. You don’t get free access to the financial books listed above. Instead, you simply get the opportunity to pay for the financial books listed above. Ultimately, the newsletter and financial education products don’t really offer much of value: instead, they’re simply designed to prevent Four Corners Alliance Group from being classified as a pyramid scheme where people aren’t selling any actual products. Typically, companies like this quickly attract the attention of regulators and get shut down. You buy into the company for $18 then try to sell people on the $30 per month subscription plan. If you can successfully “fill up your matrix” and sell people on the plan, then you can earn 80% commissions from each $30 per month subscription fee. Understandably, that can add up to a lot of money. Four Corners likes to advertise that it’s different from other multilevel marketing companies because its members don’t entirely rely on affiliate subscriptions. In reality, however, the vast majority of your income will come from convincing other people to join Four Corners Alliance Group. You may have trouble convincing someone to spend $30 per month on an online newsletter subscription, so you can expect most of your earnings to come from new sign-up fees. Should You Join Four Corners Alliance Group? Four Corners Alliance Group is a classic-style multilevel marketing company. 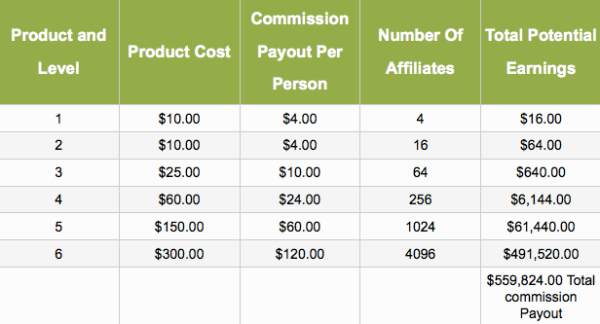 You earn money based on the commissions people pay to join the company. There are additional products here, like the monthly newsletter and financial books, but most members will find them to be of little value. It’s also important to note that Four Corners Alliance Group won’t pay you until you’ve sponsored at least 4 people. If you don’t think you can sponsor more than four people, well then you probably shouldn’t be reading MLM company reviews online. Four Corners Alliance Group isn’t necessarily a scam, but it’s one of those network marketing companies that’s walking a fine line between illegal pyramid scheme and legal network marketing company. So far, Four Corners Alliance Group appears to have avoided the attention of regulators and been able to secure nice compensation for its members. However, you may want to wait until Four Corners Alliance Group survives its first year before paying to sign up for the company.